Uruguay and Liverpool striker Luis Suaarez has confessed that he would be prepared to go to great lengths, and possibly repeat his World Cup handball, if it meant sealing his team's progress to the FA Cup final. Suarez handled on the line against Ghana in extra time of a World Cup quarter-final two years ago to prevent a certain goal against Uruguay. 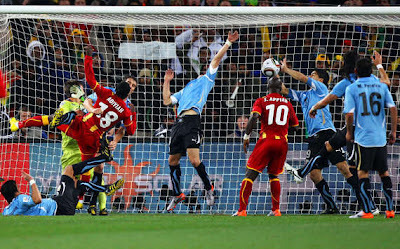 Asamoah Gyan missed the resulting penalty, and Ghana's failure from the spot in the subsequent shootout saw the Uruguayans march on to the semi-finals. Suarez's actions made him a public hate figure for some - and he has been no stranger to controversy this season either, having recieved an eight-match ban for racially abusing Manchester United's Patrice Evra - but the 25-year-old claims that he would do it all again against Everton at Wembley. The attacker maintains that success for the club is just as vital as it was for Uruguay, and that he is prepared to do whatever it takes to help achieve it. “If I am obliged to stop a ball with my hand in the last minute and we win, then I will repeat the action. “Success for Liverpool is more important to me than anything else.